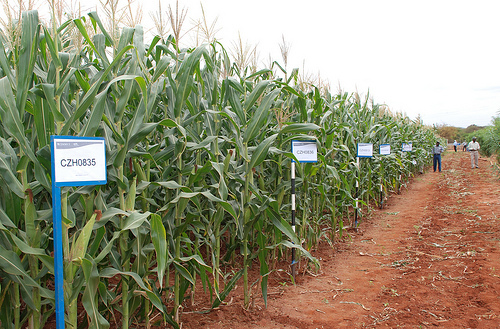 The benefits of Genetically Modified Foods are already being born out all over the world. Farmers in China and India are experiencing better health through massively reduced use of pesticides thanks to GM Crops and are experiencing higher crop yields (see here, here, and here). 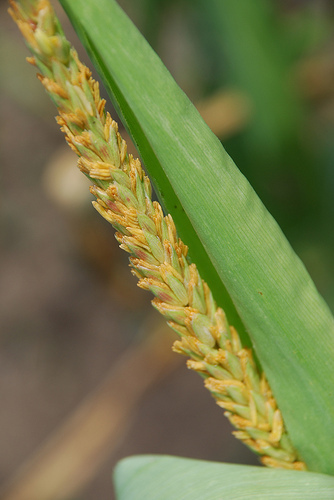 Flood tolerant rice being developed at the Ronald Laboratory of UC Davice will benefit poor farmers who are increasingly threatened by climate change. While Blood Rice will save lives by producing a key component of human blood. This year “Golden Rice,” engineered to be packed with vitamins, will be a huge weapon in the fight against malnutrition worldwide. 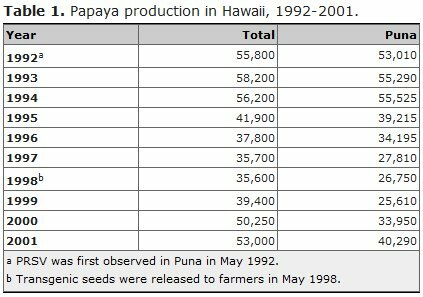 Genetically modified Papaya single-handedly saved Hawaii’s Papaya farms from extinction, by inoculating them against the ring spot virus. “Organic” food is a nice ideal, but organic farming requires more water and farmland to produce the same amount of food as modern farming. Without GM crops we will need to consume even more forests for farming, driving millions of birds and insects into extinction, and increase pesticide use. With crops that are more nutritious, resistant to pests, and can survive with less water, GM crops make organic farming a realistic possibility. The company Aquabounty has produced a salmon that includes a genetic modification for faster growth. This innovation has a huge potential to increase the output of farm-raised salmon, which would dramatically reduce the strain on natural fish stocks. Despite the incredible benefit, Aquabounty has spent 15 years working to get their salmon approved for commercial production because of public concerns over Genetically Modified Organisms (GMOs). Google “GMO Foods” and you’ll find the majority of links are about how to avoid GM Foods and health concerns about them. There was even a TED Talk by Robyn O’Brien, where she blames increased cancer rates and other health problems on the rise of GM Foods in our diets without citing any research to build a causal link. Other anti-GM Food organizations use the term “Frankenfood” to evoke mental images of monsters and mad scientists that also elicit strong emotional reactions in readers rather than provide them with facts that support their arguments about the supposed ill health effects of GMOs. The European Union has released a preliminary draft of a report reviewing hundreds of journal articles and decades of research on GM crops and have concluded they are safe (with some important conditionals). Additionally, humans have been consuming Genetically Engineered foods for thousands of years. Corn, cabbage, wheat, cows, chickens, bananas and numerous other foods modern agriculture brings to our plates cannot survive in the natural world. They have been created by humans through selective breeding. The genes being put into GM Foods are genes that exist in nature. Scientists are not putting anything new into our food supply . Ultimately the potential health detriments of GMO foods are insignificant to the deleterious health effects of modern diets. I know people who will go to great lengths to avoid GMO Foods, buying anything at the grocery store that has the “Organic” label on it, but a bag of organic potato chips is demonstrably going to do far more damage to your health than has been demonstrated with any GMO food on the market today. Ten thousand years ago, humans learned how to farm. It was an epochal invention that made possible settled life, cities, craft specialization, writing, organized religion, architecture, mathematics. science. Now humanity stands on the brink of a second agricultural revolution potentially as great as the one that occurred when our ancestors gave up hunter-gatherer way of life and settled down as farmers. Scientists and engineers are poised to genetically modify organisms to increase the yield, nutrition, freshness, and pest resistance of food plants and animals, and perhaps even to diminish the use of artificial fertilizers (and fossil fuels) by supplementing biotic nitrogen-fixation systems. Other possible benefits of genetically modified (GM) organisms include improved use of marginalized land—saving wild areas from the plow—and abundant production of vaccines and pharmaceuticals. possibly eliminating diseases such as cholera, hepatitis B, and malaria. The promise is great. But as always with the products of human artifice, not without attendant dangers. In writing this post, I was unable to find any articles or posts through search engines that were about the potential and proven benefits of GM Foods. The more than a dozen peer-reviewed examples I’ve cited above I had to find by querying the online science community. That’s not right. It’s not right for unscientific viewpoints to dominate this debate and destroy the potential for this science to create a healthier environment and produce more food and more nutritious food with fewer natural resources. It’s not right for anti-GM protestors to commit acts of violence against the scientists performing this research by destroying public property in Belgium and Australia. It’s not right for hundreds of thousands of people to starve to death in Somalia because the government rejected free grain from America that was genetically modified, citing the same “Frankenfoods” rhetoric propagated by these anti-science organizations. As Chet Raymo said, there are dangers in GM food, just as there are dangers in pesticides and corporate farming, but protestors should be pushing for vigilance in studies on GMOs, not seeking a complete ban on them altogether. Anti GMer’s are directly responsible for the deaths by starvation in Somalia and other countries that refuse food aid over GM crop concerns. As we saw earlier in this article, GM Foods not only hold incredible potential to extend the limits of what we can support on this spaceship Earth, but have already proven their potential to save crop lines and improve yields. The only way we’re going to save our environment and feed the projected nine-billion Earthlings that will live here by 2050 is the same way we came to a planet capable of feeding seven billion people, through scientific innovation, not a regression to more primitive times when famine controlled our population growth. Special thanks to Tomorrow’s Table for the best blog post out there detailing the benefits of GM crops for sustainability and food production. Unaddressed here are concerns from anti-GMO activists about corporations, like Monsato, owning and abusing the patents they own on certain GMO crops. Because this issue has to do with corporations and regulations, it is off-topic for this post, which concerns on the science of GMOs and their health safety. 20120228: Since writing this post, a lawsuit was brought against Monsanto by Organic Farmers suing the company for patent abuses. The Judge threw out the suit because not one of the thousands of farmers could claim to have been personally threatened by Monsanto and the company was found to only bring 19 patent lawsuits against farmers a year out of nearly two million nationwide (Court Transcript). 20120104: Environmentalist Mark Lynas gave a truly inspiring speech apologizing for his years of demonizing GMOs, and how through understanding the science of this revolutionary technology he has come to understand that it has tremendous power to help the environment and actually improve our health through reducing the use of pesticides and increasing nutrition for Earth’s 7 billion human beings. 20130110:AgBioWorld has a great survey of the journals, noting that we are performing animal experimentation with GMOs all the time when we use them as livestock feed. Out of 42 studies they found only two concluding harmful effects from GMOs with 40 finding no harm or even benefits. 20141017: Study of 100 billion livestock animals finds no harm from GMOs.